Hello and welcome to this issue of Knitting Know-How. Buttonholes: Video demonstration of both single stitch buttonholes, and buttonholes where you cast off two stitches and then cast them on again to make the buttonhole. The Secrets of Knitting For Profit: Book review of a book by Liz Raad covering everything you might need to know about using your knitting skills to turn a profit. And remember, if you have any knitting related questions, drop me an email and I’ll not only try to answer them for you, but I’ll also choose one or two to answer in the next Knitting Know-How. This video will answer that question and also show how to make smaller buttonholes over just one stitch that you might use on a child’s cardigan. 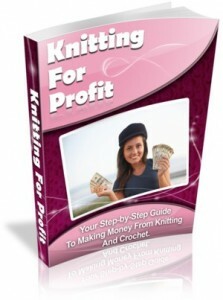 This a 130 page ebook available from Knitting For Profit. The author tackles her subject well and I felt the book was thorough and comprehensive. The book begins with basic business essentials such as writing a business plan and getting business cards, and then outlines five different strategies for making money from your knitting skills. Originally written in 2008, I’m not convinced that there have been any updates even though the sales letter offers updates as one of the bonuses! Several of the websites she cites as success stories are no longer live. In one case I discovered that the knitter in question had died in 2010. That said however, the book is stuffed full of ideas to start you thinking about what you can do to stand out from the crowd and make your knitting profitable as well as pleasurable. And, in addition to ideas of what to knit, Liz Raad also covers the marketing essentials – how to price your work and how to promote it effectively. The last couple of chapters cover Time Management and Record Keeping, both vital aspects to running any successful business. I would rate this book with 4 out of 5 stars. She would have got 5 stars if all her examples had been live websites. The Secrets of Knitting for Profit is available from Knitting For Profit. Just a reminder – I would love to answer your questions in future Knitting Know-How Newsletters so please, add your comments and questions below. Penny, you are wonderful. I love your teaching videos. Thank you so much for all the effort you put into them. Penny, could you do a video on continental knitting and purling (if you haven’t already)? I have no trouble with the continental knit stitch, but I just cannot work the purl stitch. Thank you in advance. If you have a look at the purling video on the site at Purl Stitch then you’ll see how I do purling as a Continental knitter. Just let me know if that’s not clear enough and I’ll reshoot it – I love making the videos! I have been knitting for few years and as much as I read about how to knit the first stitch, it always ends up loose. I’ve knitted really tight, I do not knit the first stitch. I pick up the first stitch from the back and still loose, is the a way to get that first stitch even with the rest of the work? I never knit the first stitch in a row. If you just slip it on to the empty needle, then knit stitch two onwards, it makes a nice edge that’s easy to sew up. It’s satisfyingly neat. I’ve just re read you question Peoline. If you mean the first slip knot at the very beginning of the work then rather than tie the knot so that when you pull the ball it tightens up, do it the other way so that when you pull the lose end it tightens up. No, I’m not left-handed but I do knit in the continental style with the yarn in my left hand. I was taught by my mother who had a Norwegian au pair when she was a child who taught her. I find it much quicker and easier than the English style of knitting.